Also called Shaoxing opera, Yueju opera is so named bacause it originated in the rural areas of Shengxian County, which was once part of State Yue (?-306 B. C.). The opera made a rapid development to become the leading opera in Zhejiang Province and one of the four principal operas in China. Yueju opera is divided into various schools, all having a soft, exquisite singing to the accompaniment of stringed and wind instrument music. Most of the works have a theme about love affairs. 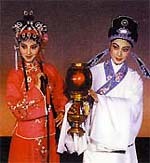 The most representive items are Lian Shanbo and Zhu Yingtai, A Dream of Red Mansions, and Mrs. Xiang Lin.